One of my favorite things about bolognese is that it's pretty hard to ruin. On a day I spent injured and still chasing around my 2 year old niece, I was tired. Super tired, I even tried that whole 'nap while they're napping' thing, but she snoozed and I stared at the ceiling instead. I'd just finished wrapping up another project and I realized I had yet to start dinner when I realized her snack hangover was only going to last so long. Luckily there was a pound of ground beef in the fridge. And 2 year olds like spaghetti. If I'm to talk about the relationship to Italy here, things get fuzzy, and kind of strict. Words mean things, especially in Italian cooking, and a bolognese to non-Italians is actually a ragù in Italy. Yes, like the brand, and no, nothing like it - much much better. I like to make mine in the Neopolitan style, and that usually starts with different meats in different textures and cuts. Authentically, this would mean pork, veal and beef. Minced or some in chunks. Thanks to a purchasing misshap I had a few fatty and a few lean pork rib slices that needed cooking. These were St. Louis Style pork ribs, some had bone in, some no bone at all, I used a mix of both and let them cook until they fell apart in the sauce. You can use any kind of pork here, a fair mix of lean and fat or ground pork. You can add beef short rib to a minced pork base, pancetta, or pork belly. You might be surprised that I add milk to this recipe, if you've never done it, please give it a try. It locks tenderness to the meat and we know pork loves milk. It does not turn the sauce creamy, but it does tone down a bit of the tomatoes zippiness to highlight other flavors. Some notes: If adding veal, I always use a bit less than the beef and pork, but equal parts is standard. 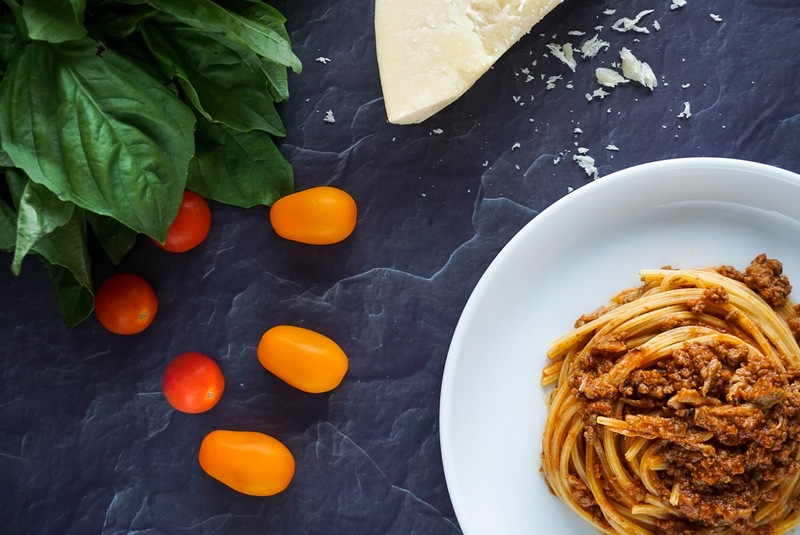 When it comes to jarred sauce I use a smooth sauce for bolognese, and I nearly always use the Mutti brand as it's the brand I used and fell in love with when I lived in Italy. It was also pretty dang affordable - because broke college student - and it seemed to be what all the Romans had in their carts too. I usually find it at import shops so it may not be easy to find in all cases, use your personal favorite. I don't really measure much when I make a bolognese because I'm pretty practiced at it, but I took some notes for you this time. Add fatty pieces of pork to the pan and brown on all sides, rendering fat. Add leaner cuts, and sear all sides. Remove pork from pan, add onions and sweat until translucent. Add additional oil - not more than a tablespoon - if necessary. Add minced garlic and stir until fragrant, careful not to burn. Add ground beef to pan and brown well. Once brown, add tomato sauce, salt, and bury the pork in the sauce then bring pot to a slow simmer over med-low heat. Add bay leaves, white wine and allow wine to cook down, about 5 minutes. Add parmesan rind and thyme then allow to cook for a few hours, checking in occasionally to maintain simmer and ensure all the meat is covered in the pot. If you find it is drying out or evaporating add a bit of water or sauce to keep meat covered. Let simmer about 2 hours until the pork begins to separate from the bone. Once soft, add milk and swirl into the sauce. Cover again and let simmer low another 30-45 minutes. Pick the pork meat from the rib and remove the parm rind. Serve over thick pasta like tagliatelle or spaghetti rigati with a nice drizzle of finishing olive oil and an extra pinch of parm.